For planners, elected officials, developers, conservationists, and others interested in the creation and maintenance of open space lands and urban green infrastructure projects or promoting a healthy economy, this book offers a comprehensive yet flexible approach to conceiving, refining, and implementing successful projects. "This is a how-to book…It rests on the premise that green infrastructure is 'the sum of all our natural resources,' but it is not about stopping or rolling back development. Instead it is about a systematic way for a community to decide 'what is important and to develop a rationale for what to protect, ending up with four or five specific goals that everyone can agree on.'" "This guide addresses a wide audience: planners, developers, city managers, landscape architects, architects, scientists, and others interested in how and where to develop or conserve land. Its simple and pleasant writing makes it valuable for professors, students, citizen groups, and conservationists. The examples given from the U.S. are applicable worldwide. It is a useful book that provides tools and tips, and I strongly recommend it." "Green infrastructure is now a commonly accepted urban planning concept. Yet knowledge about how to put together a comprehensive plan remains limited. With this excellent book, everything changes. Karen Firehock utilizes her many years of hands-on experience working with communities around the country to produce this indispensable guide." "A long-awaited, clear and concise guide on how communities, land management and conservation entities can incorporate natural assets into their planning process for a viable return on their investment." "Strategic Green Infrastructure Planning is practical and insightful. It provides a clear, step by step process for bringing consideration of green infrastructure into any community planning process. Based on years of real world expereince, it's a 'must read' for anyone interested in creating and sustaining communities that are ecologically and economically healthy." "This book offers a comprehensive process that integrates conservation across scales. At a county level, there is always a need to link local conservation priorities with regional or statewide priorities, and this book’s approach readily translates across a range of stakeholder groups with varying interests and technical skill sets." "The future of society depends on protection of natural capital that is the foundation of sustainable systems: green infrastructure. Firehock provides a well-documented and organized book about lessons learned from the efforts of the Green Infrastructure Center." 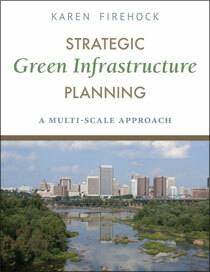 The Green Infrastructure Center recently published Strategic Green Infrastructure Planning: A Multi-Scale Approach. Please join us to meet the authors of the book, Karen Firehock and Andrew Walker. They will give a brief presentation on how to assess, map and prioritize a community’s natural assets to better protect clean air and water, provide for recreation, reduce traffic, and make better-informed decisions about where and how to grow. The presentation will highlight projects in the Richmond area and elsewhere in Virginia, and explain how to complete this type of analysis on both a local and regional basis. Following the presentation, Karen and Andrew will be on hand for a book signing. Books will be available for sale at the event for a discounted rate. Space is limited. Join Karen Firehock at the Phoenix Convention Center on Saturday, April 2 at 9:00 am. Urban trees are critical to helping cities become more resilient. One mature urban tree can capture from 700 to 3000 gallons of water per year. Imagine what a million trees can capture! Cities such as New York, NY, Los Angeles, CA, Washington D.C., Pittsburgh, PA and Richmond, VA recognize that urban forests are critical to their resilience and have created robust urban forest programs. For example, Million Trees New York is poised to meet its ambitious planting goal within weeks and the newer Million Trees Los Angeles is underway, following New York’s success in recognizing the value of urban forests. And forests don’t just hold and clean runoff, they also clean our drinking water and reduce treatment costs.The American Water Works Association found that adding just 10 percent more trees to a watershed reduces treatment costs by 20 percent. Trees also recharge the aquifer by holding the water and allowing it seep in instead of running off. To learn more about how to think of and plan for urban forests as part of ‘green infrastructure’ pick up a copy of Strategic Green Infrastructure Planning: A Multi-Scale Approach, out now from Island Press.